Science is an endeavor that has become very specialized throughout the ages. Nowadays, performing scientific research requires a college degree, and leading a study can require higher degrees along with more schooling. This is not to say, however, that only these people have the smarts or perseverance to approach a scientific problem and see it through to its conclusion. The fact is, many ordinary citizens, with no scientific or even college degree to show, have the capability and desire to work on scientific problems. With the advent of the internet, it has become easy for people with an eagerness to feel a part of discoveries to actually contribute to projects with scientific value. But the opportunity existed long before we all signed online. In astronomy everyone shares the same laboratory, the sky. Astronomers with Ph.Ds use giant telescopes to look at the same sky you can walk outside and look up to. Many amateur astronomers have taken advantage of just that. Many of the comets and asteroids discovered were done so by backyard telescopes like you might receive as a present. ABC News featured an article with 7 Great Discoveries by Amateur Astronomers which include comets hitting planets, advances in telescope design, new types of galaxies, and spotting supernovae. Here, I present some of the best places to do citizen science in astronomy. Like many of the other guides, this one is not complete by any means, and will be updated continuously. This citizen science hub in astronomy is host to a multitude of projects that fit to the researcher’s tastes. Moon Zoo – Explore images from NASA’s Lunar Reconnaissance Orbiter and help map our Moon like never before. The Milky Way Project – This tool will keep you busy all day. In nebulae around our galaxy, stars are born and die, and create hot, ionized regions of gas that shape their environments. This project shows the user an image of a nebulae (or part of a nebulae) taken in the infrared by the Spitzer Space Telescope and asks the user to draw “bubbles” using an annulus drawing tool. The user can also flag pockets of red diffuse areas and green knots in the images. Solar Stormwatch – Spot and Track solar storms to help solar scientists get past the subjectivity of only one person identifying storms and immense amount of data the scientists cannot hope to get through. Planet Hunters – Easy, look at a time-flux plot to identify possible transit events. Old Weather – Use observations made by Royal Navy ships in the early 20th century to help recover worldwide weather. The American Association of Variable Star Observers is celebrating its 100th year of citizen astronomy in 2011. The AAVSO is a collection of amateur and professional astronomers from 52 countries that work to observe and analyze variable stars. The organization is home to the largest database of variable stars, and hosts mentoring programs to help new observers become proficient. While this program attracts more experienced amateur observers up to the challenge, the contributions are very valuable because professional astronomers do not have the time or the telescopes to gather brightness changes in thousands of variable stars (at least until LSST when repeat observations are made more often). Citizen Sky – A program sponsored by AAVSO to study the mysterious star epsilon Aurigae. This star is an eclipsing variable which means it has a companion that passes between us and the star resulting in a dip in brightness. The riddle is that the eclipse lasts 2 years! What kind of object could do such a thing? Check out their website to read about some theories and contribute yourself! 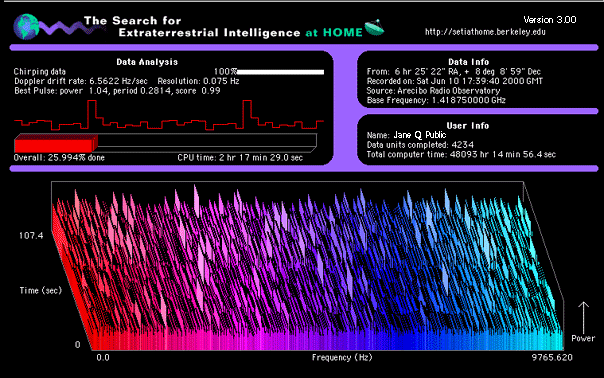 A sample screenshot of SETI@Home. SETI (Search for Extraterrestrial Intelligence) is the largest effort ongoing to listen for E.T. How do they do this? One method is by listening for radio signals, but there is a problem. A tremendous amount of data comes in every second from SETI’s radio dishes, and only a small fraction can be analyzed by even the organization’s fastest computers. Detecting the weak signals requires computing power SETI just doesn’t have. Back in the late 90’s, SETI launched a program called SETI@Home which makes use of thousands of idle computers in volunteer’s homes around the globe. It works like this: First, you download the “Screen Saver” which is the program that runs when your computer is idle for some set amount of time. Your machine retrieves a set of data sitting in SETI’s storage, analyzes it for artificial signals from space, and sends the results back to SETI. Just like a screen saver, when you get back to your machine it turns off and waits for the next time you leave your screen for a while. In 2006, the Stardust payload successfully landed in Utah after flying through comet Wild 2 in 2004. During the fly-through, the craft collected a plethora of particles from the comet itself, but also a few rare gems called interstellar dust particles. These dust particles are extremely valuable to scientists, but it is estimated only ~50 such particles were collected because of their rarity. These particles are very small (~1 micron) and need to be located on an aerogel sheet some in area. There is also some thickness to the sheet making focusing an additional degree of freedom for a microscope. Scientists have requested the help of citizen scientists to poor over some 1 million “focus movies” of different parts of the aerogel to locate these precious particles. Any user that discovers a particle will have their name as a co-author on any paper published announcing the discovery! Cratering rates have been used for decades to date surfaces in the Solar System. This project uses a collection of images from the Moon, the asteroid Vesta, and the innermost planet, Mercury. Users draw circles over craters to determine positions and diameters. And planetary scientists use size-frequency distributions of these craters to date surfaces relatively with respect to one another, and to callibrate models of cratering rates called isochrons. Like SETI@Home, Einstein@Home utilizes your idle computer to search for gravitational waves in data from the LIGO gravitational wave detector. The project also utilizes data from the Arecibo radio telescope to search for binary pulsars!